Have you heard about the great new mobile web marketing technology called “Responsive Design”? If you haven’t, you will. Responsive design makes websites more accessible to mobile users. Increased mobile traffic. Great Jakes examined data from the law firm websites that we host and maintain. The data for the past year indicate that the number of visits coming from mobile devices has increased by 101% over that period. That translates to slightly more than one in ten visitors who use a smart phone or tablet device. As the graph below indicates, usage is projected to continue to increase. New screen-sizes require new technology. The size and shape of mobile devices keeps changing with each new tablet, smart phone or other whiz-bang device that gets dreamed up (like Apple's rumored iWatch). Simultaneously, users find the experience not as good. Google reports that 48% of mobile visitors say that they feel “frustrated and annoyed” when on sites that are poorly optimized for mobile, and 36% say they feel like “they’ve wasted their time” when they visit those sites. Responsive design was created to meet the unique needs of mobile users. It does this by repackaging each page of your firm’s website to fit on any screen size, automatically. Therefore, it doesn’t matter whether your website visitor is on an iPhone, iPad, laptop, desktop, Kindle or even a cinema display. Your website automatically expands and adjusts to fit the format. More important, responsive design is ideally suited to support content marketing. It enables mobile users to see the firm’s actual website, not a slimmed-down “mobi” version. That means all the content that you post can be found, read and shared – primary things mobile users use their devices for. The promise of responsive design technology is that it makes all the things law marketers are already doing with their websites, accessible to a demographic that is growing rapidly. If creating and sharing content is a priority for your firm, then having a website that is optimized for mobile can no longer be an afterthought. That’s why we’re encouraging all our clients to include responsive design when developing their websites. I’ll be speaking about this at the LMA conference in Las Vegas on April 9th, but if you’re unable to make it, feel free to contact me. I’m happy to arrange a demo. Mobile and responsive designs have become a top-priority for us in 2013 too. They’re better for users and recommend by search engines (https://developers.google.com/webmasters/smartphone-sites/details). 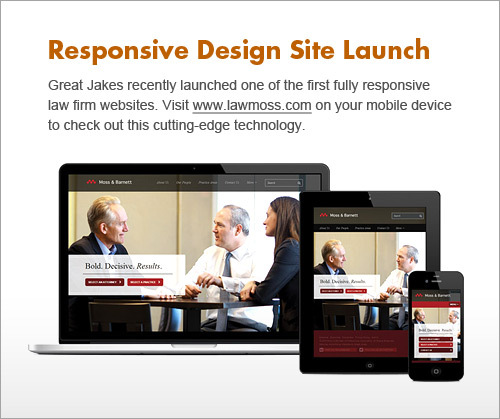 Have you come across any good examples of responsive legal sites? Great Jakes rocks! I continue to be impressed with the leading edge thought and development work of Great Jakes. Looking forward to learning more as we develop our own mobile capabilities at Waller. Today everybody is talking about responsive design sites, but very small number of people know what a responsive site is? Robert you have explained well on this topic. As soon as the android is introduced, large number of people shifted to mobile devices. And now to make a successful website it is necessary that it should be responsive.